So last week I had the honor of tabling with my Angry Artists Studios partner J.M. “The Indy” Hunter at SPACE, presented by Bob Corby and Back Porch Comics. It’s an annual indie comics event held in Columbus, Ohio. So many great laughs and good times shared with fellow creators. Special thanks to the Terrors, Amy and Jude (head of the Outhouse) for giving me a couch to crash on last weekend. I met a lot of great creators, several I still need to follow up with in the next couple of days. All in all it was a very inspiring trip and I even managed to sell a few books and prints. Can’t wait to do it again next year! 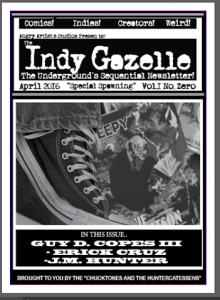 And, oh yeah Hunter and I debuted the Zero issue of our new quarterly comic, The Indy Gazelle. The debut issue is 6 pages, available for $3 details on the where and how to buy later). We’ll be expanding the format for issue #1 and beyond to 16 pages of comics, interviews, and other cool comic book shenanigans. We’ve added more collaborators and the future is bright for the, uh, future of the Gazelle. Check out the cover.